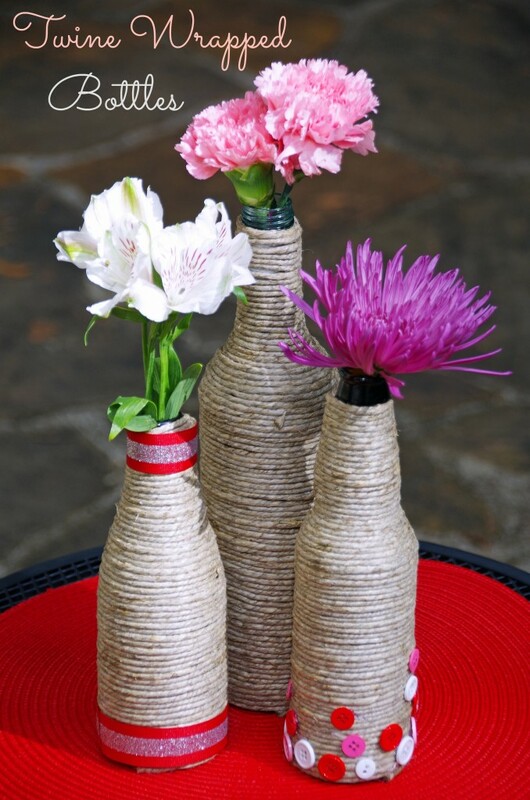 I’m always looking for upcycled craft ideas and since we have plenty of leftover beer and wine bottles in the house, this one sounded like fun. Upcycled crafts ideas are great because you take something old that no one really needs and turn it into something pretty! I had bought a huge roll of hemp twine a few weeks ago for only $10 at Michael’s (even less since I used a coupon!). Toss in the cost of the bottles (FREE! ), some glue and a few decorative accessories and you have a DIY centerpiece for very little money out of pocket. When I was researching on the internet about how to wrap a bottle with twine I really thought it would be difficult to do. Or at least very time consuming. Not being the most patient person when it comes to crafts, I thought for sure this project would be difficult. 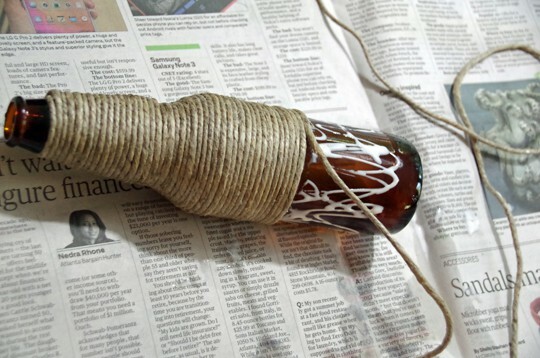 I was pleasantly surprised at how relatively easy it is to make a twine wrapped bottle! A dab of hot glue, a whole bunch of hemp twine and some good old Elmer’s white glue are all you need. The process of wrapping the twine around the bottle was very easy, although I did get quite a bit of glue on myself in addition to the bottle. I am not a particularly neat crafter! If you are looking for inexpensive and easy upcycled craft ideas I definitely recommend you give this one a try. I used ribbon I found in the art closet and some simple buttons from the craft store to make a cute centerpiece for our table. You can fill the vase with flowers or a candle or just leave the bottle empty and display it on your mantle. 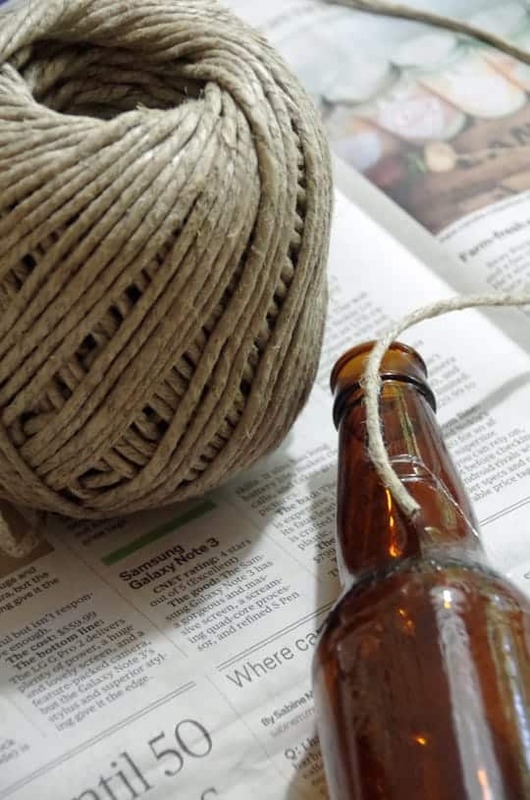 One note on this upcycled craft idea if you plan on trying it…I wasn’t sure at first whether to bring the twine wrapping all the way to the top of the bottle or leave a small amount of the bottle showing. Now that the project is complete I definitely wish I had brought the twine all the way up to the top. Also, you do NOT need to remove the label from the bottle since you are hiding it all with twine. Leaving the label on will work just fine and you can save yourself a step! Hot glue the end of the twine to the top of the glass bottle as shown above. You want to glue about 2 to 3 inches of the twine perpendicularly to the mouth of the bottle. 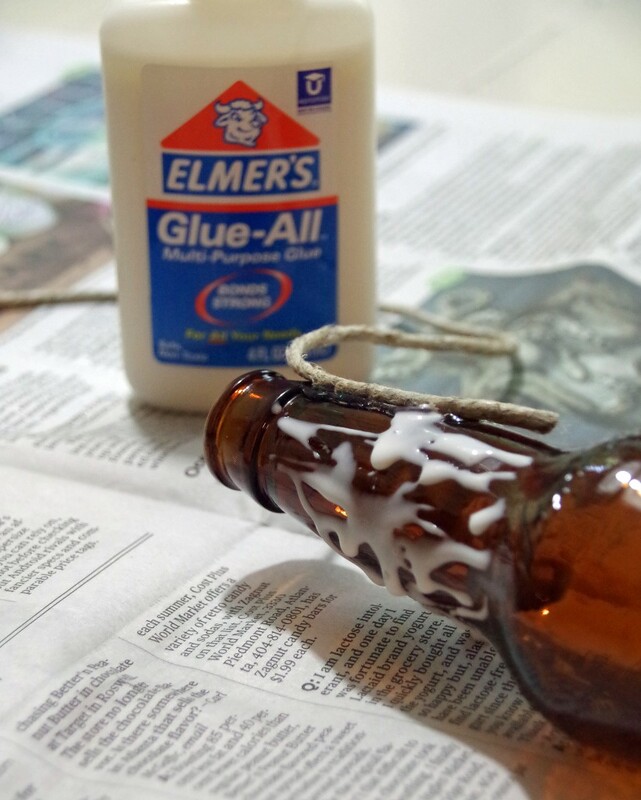 When hot glue has cooled, apply Elmer’s glue all liberally to the bottle and start wrapping. Try to keep the twine snug but a few small gaps or a bit of unevenness is fine. 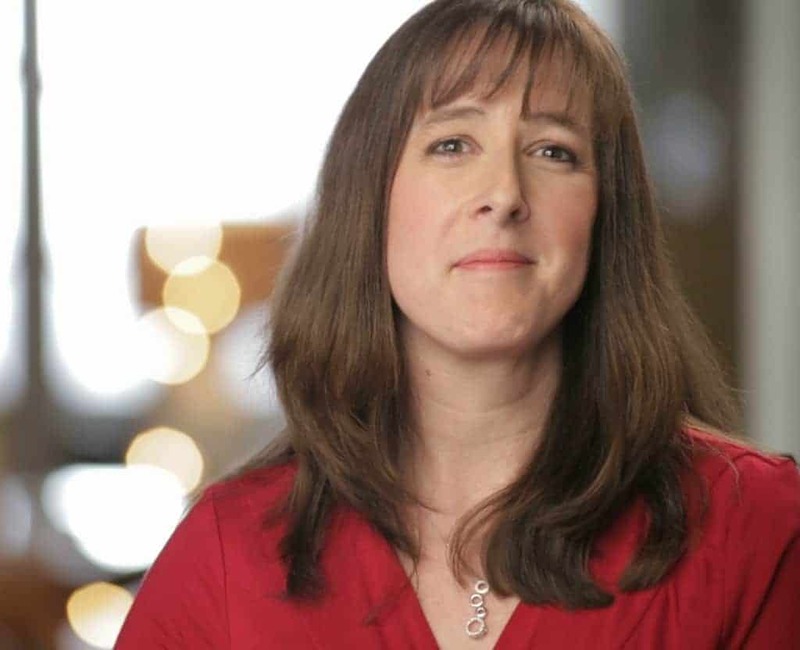 You are not looking for perfection! When you get to the end of the bottle you want to hot glue the end of the twine to the glass. Make sure that the bottle can sit flat on the table before the final gluing. Decorate the bottle with ribbon or buttons if desired. Fill with water and add flowers if you want to use it as a vase. Follow me on Pinterest for more upcycled craft ideas! glad you like it! I had fun making it!